This month the Conservation Column will leave the Rogue Valley to focus on an issue of great importance for bird conservation in eastern Oregon. This concerns the future of Lake Abert, a saline lake in the remote high desert northeast of Lakeview. The lake is a fall migratory stopover site of tremendous importance for Great Basin waterbirds, especially Eared Grebes and Wilson’s Phalaropes, which gather there in hundreds of thousands to feed on brine “shrimp” and brine flies. The Oregon Dept. of Water Resources has still not released a Proposed Final Order (PFO) on the application filed by River’s End Ranch in 2015(!) for an extension of time on its water storage and surface water permits. The reservoir is immediately upstream from Lake Abert, and the only way water reaches the lake is when the reservoir can’t handle more water. This is the key/only regulatory handle that Lake Abert advocates have right now. The PFO apparently has been drafted, but for unknown reasons not released. National Audubon is tracking this permit process closely and will share what it knows when it is out. 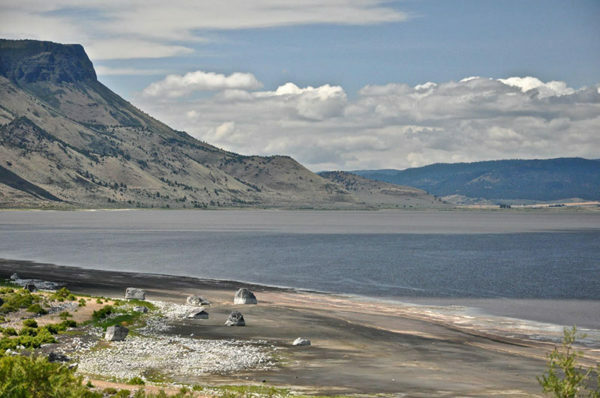 LAKE ABERT, Ore. – Migratory birds and their food sources decrease when a lake’s water level is low and the concentration of salt — or salinity — is high, according to a recent report. A study based on data gathered over 25 years at Lake Abert, found that as surface water levels decline, salinity increases, affecting the availability of brine shrimp and other invertebrates — a key food source for waterbirds. Lake Abert is among the most important lakes to migrating waterbirds in the western United States. The latest results from researchers at the University of Montana, National Audubon Society, Oregon State University, and East Cascades Audubon Society (ECAS) show that Lake Abert has decreased by 618 acres (nearly 200 football fields in size) since 1986. Water levels have decreased due to water diversions for human uses, drought and climate change. During periods of low water and high salinity, bird sightings at Lake Abert declined by as much as 82 percent. The study, A salt lake under stress: Relationships among birds, water levels, and invertebrates at a Great Basin saline lake, combines data on waterbird use, lake measurements, and invertebrate abundance collected over the past 25 years to document how waterbird numbers changed in response to changes in lake area, salinity and food sources. “Water in the West is a precious resource, and there is urgent need to better understand and manage use of water throughout the region for the benefit of birds and people,” said Stan Senner, vice president for bird conservation at the National Audubon Society. There are also economic costs to the reduction of lake area and increase of salinity. One of the report’s coauthors, Keith Kreuz, had to give up his business at Lake Abert due to uncertainty in the abundance of brine shrimp from year to year. Brine shrimp are used worldwide as a food source in commercial fish farming and for fish food in aquariums. Saline lakes, which provide critical habitat for migratory birds, are threatened globally and especially in the arid western United States. Lake levels have diminished over the years due to a combination of water diversions, drought and a changing climate. For some species of birds, including Wilson’s Phalarope, Eared Grebe, and American Avocet, at least half of their global populations rely on this network of saline lakes for food and rest during migration; some of them also nest in the region. Proper management of Lake Abert and other saline lakes in the West is critical to the conservation of waterbird populations in the Western Hemisphere. For this study, waterbird data were drawn from Bureau of Land Management and the East Cascades Audubon Society surveys, which used the time and efforts of dozens of community scientists to document changing bird numbers at Lake Abert. “ECAS was pleased to work with community scientists to study the long-term effects of this beautiful lake and the birds that depend on it,” said John Reuland, volunteer coordinator for the Lake Abert study. Dr. Johnnie Moore, former chair of the Geosciences Department at the University of Montana and world-renowned water scientist, also contributed to the study, which was published in the international journal, Biological Conservation. Here at RVAS, we will continue to monitor the Lake Abert situation, and speak out for the preservation of this remarkable ecosystem, so vital to the waterbirds of western North America.